I never thought that determining the proper image resolution for my new Epson Stylus Photo 2200 inkjet printer would be a difficult task. I have been using a Kodak 8500 dye sublimation printer for over a year. It was simple, just set the resolution at 314 PPI, set the image dimensions desired, and go. Setup is also needed for color management but this article will focus on the single goal of determining the optimum digital image resolution for this inkjet printer. We will not be focusing on image resolution as a function of viewing distance. This is a valid and well documented topic but it doesn’t relate to the discussion at hand. PPI (pixels per inch) defines the digital image resolution. A pixel is a discrete, atomic picture element. It represents a single tone for a single point in the image at a vertical and horizontal coordinate. LPI (lines per inch) is an output device resolution typically used to describe commercial or fine art printing with devices that are incapable of continuous tone printing. It is sometimes also known as line frequency, screen frequency, and halftone resolution. A printer line consists of a row of cells or matrixes of smaller dots that constitute a single tone. DPI (dots per inch) is an output device resolution typically used to describe inkjet printers. The dots represent the smallest physical size of the ink drops on the output media (paper). Multiple dots are needed to reproduce a single tone. RIP (raster image processor) is the software that converts the digital image into a raw bit map file describing the placement and size of the ink dots on the output media. Some folks reserve the term RIP for Postscript processing only. Don’t get too hung up in the semantics. All printer drivers have to perform basic RIP functions to map the image pixels into the printer elements (pels). Some RIPs don’t even support Postscript. In many cases, the RIP software can be as important as the printer hardware. In fact, there is a significant OEM after market supplying RIP software for professional and large format printers. Sometimes the RIP software costs as much as the printer hardware. These relationships are illustrated in the figure below. Note that in this example, 360 LPI can be a cell of 2x2 large dots or 4x4 smaller dots. A continuous tone printer (DyeSub, Lambda, or Lightjet) completely fills each printer cell with a calculated density and mixture of dyes. The dyes blend with each other and spread into the fibers of the paper. In this case, the image resolution should be equivalent to the printer resolution. If it isn’t, the printer driver (RIP) will need to interpolate it. The printer resolution is given in the printer specs and does not vary. Various inkjet technologies are used to push the ink through a nozzle in the ink cartridge and create the actual droplets on the paper. And various dyes are employed for their different properties. The droplets sit on top of the paper surface. Although there can be some spreading, the ink is opaque not translucence so there is very little blending. A second droplet at the same location would overlay the first color instead of blending with it. So, for each image pixel the RIP software has to calculate the placement and size of the ink drops in a grid layout. This is a fundamental difference between inkjet and continuous tone printers. LPI has traditionally been used to describe printer resolution. The term originates with early black and white printers that use a halftone grid such as those still used for newsprint. It refers to the number of halftone cells that occur in a linear inch. Each cell is further subdivided into a grid (matrix) of dots. The number of cells per inch determines the resolution (LPI) while the number of dots in the cell determines the number of tones that can be reproduced. A “line” is one row of grid cells. With only one ink, a 1x1 grid can only display two tones, black and white. This is more correctly called line art. A 4x4 grid can reproduce 17 tones. 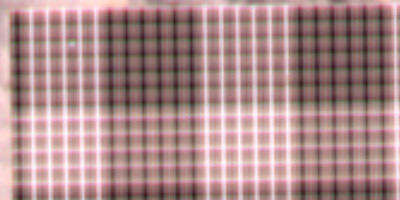 An 8x8 grid can reproduce 65 tones. At a fixed DPI there is an inverse relationship between the resolution and the number of tones that can be reproduced. This is a crucial factor that is often overlooked when printing specifications are quoted. To add to the confusion, the LPI is sometimes a density measurement and sometimes a resolution measurement. True resolution measurements should always be expressed as line pairs (lp/in), not just lines. There is a direct relationship between the printer LPI and the image PPI as long as both are expressed as density measurements. To minimize interpolation artifacts from the RIP software, this should be one-to-one. 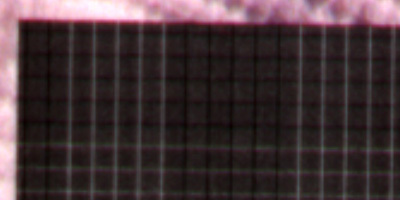 The most frequent artifacts are moiré, banding and/or aliasing (jagged edges) in the image. If the image PPI is too high, it is interpolated down and image data is lost. 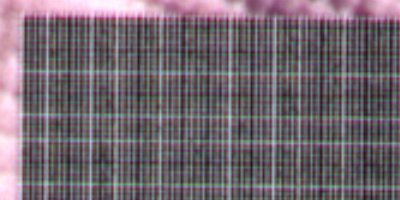 If the image PPI is too low, it is interpolated up. Unfortunately, the interpolation is done with “nearest neighbor” and there is no additional sharpening after resizing. Photoshop can always do a better job. Once the native resolution of the printer has been determined there is no valid reason for using a higher image resolution. There are valid reasons for using lower resolutions. This is where the traditional evaluations based on print size and viewing distance come into play. The printer resolution might even be set lower than its maximum achievable resolution to enhance print speed. If you want to avoid artifacts of printer interpolation you should use image PPI values that are evenly divisible from the printer resolution. If the printer resolution is 360 PPI, an image resolution like 180 PPI should produce excellent results with large prints. DPI is frequently the only resolution measurement given for inkjet printers. While this gives the manufactures a measurement to one-up each other, it is a horrible metric for determining what the proper image resolution should be. There are many reasons for the resulting confusion. First is that like the half tone process, the number of ink dots in a cell determines the tonal range, but the size of the cell determines resolution. In reality, the number of tones is further expanded through the use of multiple inks. Second, the newest inkjet printers use variable size dots to achieve the desired tones. For example, shadows typically are reproduced with larger dots while highlights typically use the smallest dots. Third, the horizontal resolution (DPI) is often higher than the vertical resolution. The size of the image cell has not changed, but the size of the droplets does change. Fourth, advanced techniques such as stochastic dithering and error diffusion are employed to smooth out the tonal range. Last, many inkjet printers can be set to print at various optional DPI settings. The most serious problem with the DPI metric is that most inkjet printers don’t give you any clue at all as to how big the image cell is. They do not specify the native printer resolution in LPI or PPI. So, the challenge is still to figure out what the native size of an image cell is for a given inkjet printer. Once this is known it is possible to select an image PPI that does not need interpolation in the RIP (driver) software. The ink cartridges in the 2200 contain 96 nozzles each. These are arranged in a 4 x 24 grid. However, the droplet sizes are measured in picoliters (volume) instead of micro-inches. This only suggests a grid size of 4x4 and six cells in a vertical line. The nozzle spacing is mechanically fixed of course. The paper movement is also fixed. But the horizontal alignment and droplet size can be varied. The following table shows the dot size in inches and microns at various DPI settings. This does not answer the LPI question, but it does give some insight to the necessary dot sizes. The maximum resolving power of a normal 20/20 human eye is stated with different metrics in different publications. One frequently quoted answer is 5 line pairs per millimeter at 25 centimeters. Another is a single line of 30 microinches at ten inches. Yet another is one arc minute (1/60°) at any distance. Mathematically, these are all essentially the same. Translating these metrics to image density, the optimal matching image resolution range is between 200 PPI for an 8x10” print and 350 PPI for a 4x6” print. Today’s inkjet printers are rated at 1200 or 1440 DPI. These dots must be arranged into cells to reproduce more than two tones. A larger cell yields more tones, a smaller cell yields more image resolution. This is an unavoidable tradeoff. The cell size must be an integer. Sample cell sizes are shown below along with the resulting printer LPI or image PPI. I can find credible references that state the resolution for the Epson 2200 as 300, 360, and 720 PPI. These seem reasonable, but which is it? 300 PPI does not match any cell size at 1440 DPI. At 1440 DPI and 360 PPI the cells would be 4x4. A 4x4 cell can only reproduce 17 monotones, but there are seven ink cartridges so this could yield 113 color tones. At 2880 DPI and 360 LPI, the cells would be 8x4 yielding 33 tones or 225 colors. Combining this with variable droplets at three different sizes (4-20 picoliters), the tonal range could be theoretically extended to 672 tones at 2880 DPI. This is still below the 768 tones in an eight-bit RGB image. The same assumptions at 720 LPI would yield a cell of only 2x2 dots. In my opinion, this would severely limit the tonal range. At 180 LPI the cell of 8x8 dots enables a broad tonal range, but resolution must suffer. Some have suggested that size of the printer spool file is a reliable indication of the PPI needed for an image file. My own experiments here disprove this theory. The Epson print preview screens show all sorts of resolution artifacts at various DPI and PPI settings. But they change with the preview zoom and there is no one-to-one zoom ratio option. The preview never even resembles the actual print. 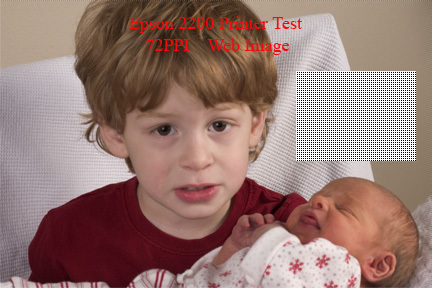 The Epson print preview screen is totally worthless for validating either resolution or color fidelity. About all that it does faithfully represent is the image borders and paper margins. So, the only validation will have to come from actual prints. These were done at 1440 and 2880 DPI on Epson Premium Luster Photo Paper. More surprises. 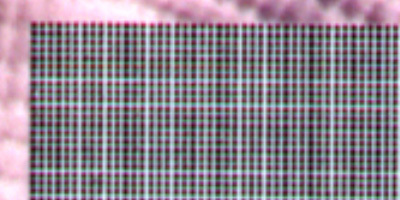 All of the prints had some sort of plaid pattern in the area of the image where the alternating black and white pixels were. 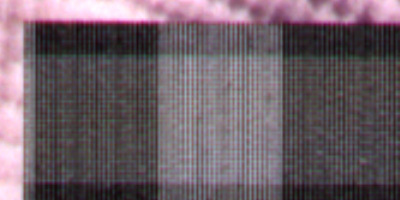 The pattern varied with the image PPI but it did not vary with the DPI setting. None of the patterns resembled pure alternating pixels. This is disconcerting because it clearly implies that image moiré patterns and banding are likely that will not show in the Photoshop or Epson preview screens. I have scanned some of these for illustration. The first two scans show the results of testing with my Kodak dye sub printer. This was included as a sanity check. It illustrates a perfect resolution match at 314 PPI, but for some reason the scanner picked up a strong color cast. In reality the printed patch was visually much closer to a true gray. The dye sub printer does not have a black dye and this old scanner has almost no color management. You have to look at the print with a 15x loupe to see the dots, but they are perfectly sized and symmetrically alternating. As you can see, when I printed a 360 PPI image on the dye sub. I got a banding pattern. Any printer technology is subject to artifacts if the image resolution does not match the line frequency. The rest of the scanner fragments are from Epson 2200 prints. The scanner was an old flatbed. The highest resolution I could achieve was 720 DPI and there are dust and scratches. I did no corrections or enhancements. In spite of the limitations, these fragments do faithfully illustrate the artifacts of mismatched image/printer resolutions. I took an unscientific poll of friends and family and asked them to judge the ten Epson prints for photo quality. No one could see any difference between 1440 DPI and 2880 DPI. Most could not see any real difference in any of the prints. The only significant difference between the Dye Sub and Epson prints was the paper stock, not the image. The few that were willing to state an opinion favored the 240 PPI image. The consensus was that this produced a slightly better tonal range. Some picked the Dye Sub print until I asked them to go back and pick one of the Epson prints. The bizarre grid patterns hardly got a mention. Since no one had a preconceived expectation, what it was was what it was. Even the fact that the patterns changed was ignored. The text was sharpest at 720 PPI and in the Dye Sub print, but you have to look with a loupe to see the subtle differences. I am not going to waste any more time, paper, and ink on 2880 DPI. It does not appear to add any sharpness, but it does seem to add to the ink density and may improve shadow details. No one suggested 288 PPI as a possible answer. But, 1440 DPI divided by 5x5 cells would yield a match at 288 PPI. This test produced brilliant results. 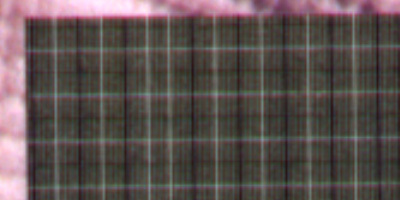 In fact, at 144 PPI you can clearly see that the pixels are square with a loupe. 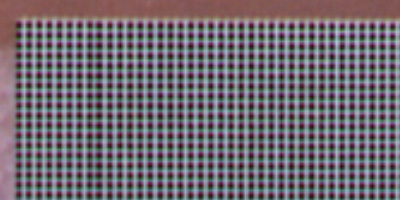 There is no artificial pattern at either 288 or 144 PPI, viewed with the naked eye or with a loupe. My scanner picked up a slight banding at 288 PPI that I could not eliminate even by changing scanning resolutions. Please trust me on this, the print image is crystal clear and smooth at both resolutions. 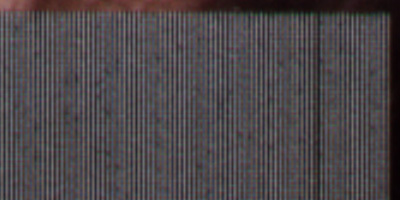 At 288 PPI, under a loupe, the vertical resolution is slightly less clear than the horizontal resolution. I cannot correlate this finding to a cartridge with 4x24 nozzles. In other words, how does a 5x5 cell map to 4x4 nozzles? And, there is still a vertical line every 3/4 inch. It is clearly 3/4 inch from the left edge of the print and repeats uniformly across the page. It only shows in the grid areas. On re-inspection, I can find this same line in all the tests at any resolution. It is not in the image data. It appears to be a different, mysterious, artifact of the Epson print driver. I cannot envision a realistic photographic or graphic image that would likely be affected. So the 2200 printer lays down the ink dots at 288 LPI (density). As a true resolution metric it would be expressed as 144 line pairs per inch (lp/in). Until Epson provides some better objective rational, I will be sticking with 288 PPI as the default image resolution for this printer. This does not mean in any way that you cannot get satisfactory prints at 300 PPI or 360 PPI or whatever you are happy with from a subjective point of view. But if you think about it, everyone seems to agree that sharpening for print output should be the last step in your workflow. And that moiré correction should only be done at a one to one viewing ratio. Interpolation can easily adversely effect either. So why would you want to send images to the printer that are guaranteed to be interpolated? By the way, the 300 PPI defacto standard for prints fits nicely with inkjet printers at 1200 DPI using 4x4 cells. I still haven’t gotten any intelligent responses from Epsom after five months of trying. But I have heard from others including some from University Art departments and Museums. These folks are using very high-end printers such as Durst Lambda. All have been complimentary. And I have heard from some folks using mini-labs and the Fuji lightjet printers. Since I am also using a Fuji mini-lab for large volume small prints and my spouse works for Walgreen, I tried the same experiments on a lightjet. First, I had great difficulty honing in on the results I expected. The best results were at 300 PPI but even this was not as good as I wanted. To make a long story short, I talked the local Kiosk operator into loaning me the technical and setup manuals for a few hours. This was over 30 pounds of manuals. In the hardware specs I found that the laser beam put a light circle on the paper at .8 mm diameter. This works out to an image PPI of 317.5. Strange but true and Photoshop was quite happy with this. The results were clearly amazing. But there was still a light shadow of a pattern that would only go away at 158.75 PPI. Nothing else would eliminate it completely. So, I went back to the books. In the software section I found that they were employing error diffusion and dithering algorithms based on an image resolution of 300 PPI. I finally had the ultimate and definitive answer. The software was assuming a different line frequency than the hardware was designed for. 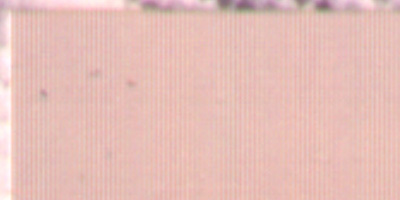 Either 300 PPI or 317.5 PPI would produce optimal results, but there was no perfect answer because the hardware and software are using different assumptions. Epson still has their heads in the sand. Until they recognize the fundamentals of printer line frequencies they will continue to give bloated and incorrect answers such as 360, 720, and a recent answer of 1440 PPI. And yes, their software error diffusion does not match their hardware line frequency either. My most recent query to Epson about a different serious defect got the reply that I should be happy that they were willing to sell their fine product to me. They are considering improvements to the preview screens and usability for future new replacement products. If I want, I can pay for these also. I hope you enjoyed this article and learned something from it. When I hear something more definitive from Epson, I will post it here and on the Nikonians Printer forums. Two of the test images I used are available here: EpsonTestPattern720dots.zip (750KB) and EpsonTestPattern288dots.zip (9MB). Some other observations related to the Epson 2200 and some comments on the dialogue with the Epson support center are at the following link. A glossary of some printing terms used in this article is available at this link. Please send me an Email if you have any comments on this article.